So this is how consumer electronics marketing works in 2017. LG is stoking interest in this year's flagship smartphone, the G6, by releasing an interview with a man who has actually seen one. The phone is officially due to be launched at Mobile World Congress in Barcelona on Sunday, but the modern marketing game involves weeks of teasers, typically involving carefully arranged "leaks". The only company not to use bogus leaks, as far as we know, is Apple. Brands are now keen create an impression before the cacophony of MWC actually begins. News gets lost at a show that attracts more than 100,000 attendees, even though the industry's two most important companies, Apple and Google, stay away. The man who has actually seen an LG G6 turns out to be a Danish designer called Torsten Valeur. 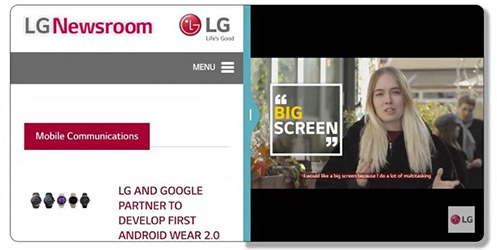 In reality, though, the series' website allows everyone to glimpse the device with LG's blessing. LG has taken a more conventional approach, closely resembling the Apple iPhone 6/6s and Google Pixel. It abandons the bold approach LG adopted for 2016's flagship, where it hollowed out the body to make room for an expansion slot. The slot could house cards (or "Friends") such as an extra battery, for example, or an audio DAC. But the modular gambit never took off – by summer LG executives were admitting that it had hurt sales. The G5 was also finished in material that didn't match the phone's premium specs, we noted. The G6 boasts an edge-to-edge (or "bezel-less") 5.7-inch display LG calls "Full Vision", and is expected to be waterproof and dustproof. It also appears to have a cleaned-up UI. Leaks suggest the display introduces a new aspect ratio: 18:9, or 1440x2880 resolution. Today's flagship displays include a 1440x2560 16:9 panel. The G6 is also expected to feature Snapdragon 821, 4GB of RAM, and LG's DAC from its audiophile V20 model – a phone released in the USA, but not Europe.